It's been so hot these last few days I've been wondering about air conditioning for some of my rooms. My foam roof provides a 10 degree differential with outside temp during daytime -- it was 92 in my BR area which faces West when outside was 102. Your A/C choices are limited, and there are several postings in the archives on the subject. (1) Unico -- the last price check I did was $30K (new roof needed), and no one in the Network reported doing this for obvious reasons. (2) Through the wall room conditioners -- popular, but unsightly. 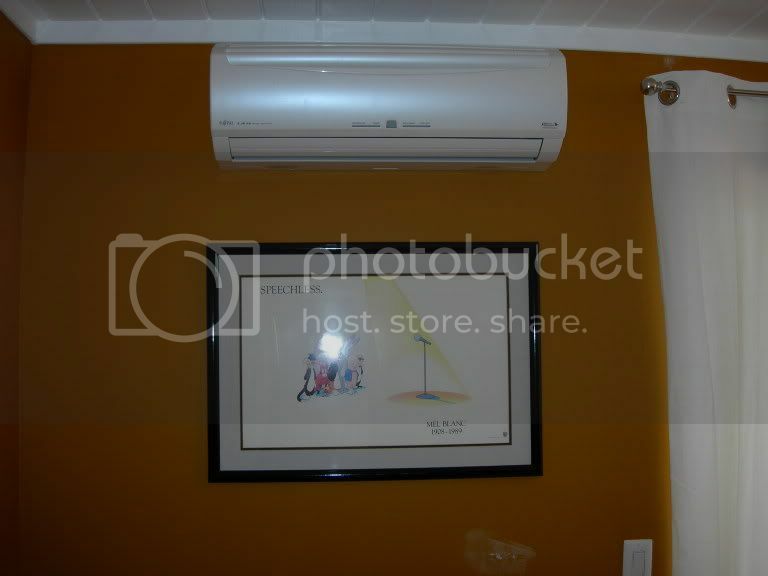 My last quote was $2,000 for 2 (A/C units are cheap, but contractor installation is steep) -- this was from Los Gatos Air. (3) Mini-split -- the preferred choice if you can part with a minimum $5,500 for 2 air handlers. I had a 1-zone unit done for $2,800 as part of a re-model, and that's where the family slept for the past 2 nights. You may need to upgrade electrical panel -- a 2-zone mini-split requires 20-30 amp service for 2 x 9-10,000 btu handlers. For a societal stamdpoint, we are straining the enviroment with more A/C and California seems to still struggle with its power grid distribution. I have a whole house fan in the garage which is fair for air exchanging, but it is not working -- an exchange fan is great when outdoor temp is cooler than inside. If you search back you will see a number of threads regarding this. We chose to go this way so we wouldn't have the duct work on the roof and we would have more control over which rooms we wanted to heat or cool. We finally got two units up and working on Saturday. It cools the room down quickly and they are extremely quite. Interior Unit are wall mounted. They need to be placed on a exterior wall so they can have a condensation drain. Jeff: wow, what an installation! For the benefit of pattiann, let me try to expand on your photos with my somewhat educated guesses. I don't know if you went for the max. 6 indoor units; if you did, the capacity is about 60,000 btu's (4 x 9,000 & 2 x 12,000) -- at an EER of about 11, you could be using 45-50 amps of current with all units running -- you had either a 200amp panel or upgraded. The cost had to be around $10,000; the A/C units are about $5-6K via internet and the contractor won't underprice his labor. Mini-splits generally are limited to 49 feet max run and I wonder whether it was exceeded in one or more indoor units. Yes, they are quiet, but the outdoor unit emits the usual high pitch compressor whine, and your neighbor near the shed will hear them if a window is open or they're outside. "I don't know if you went for the max. 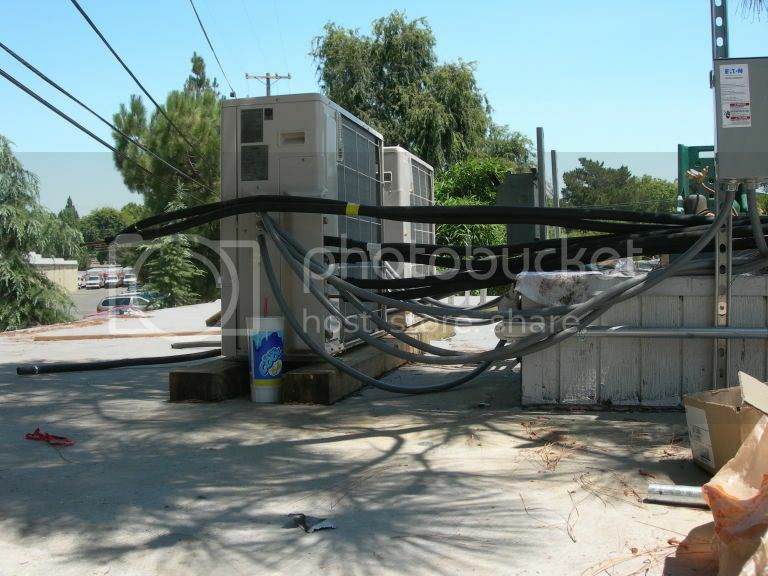 6 indoor units; if you did, the capacity is about 60,000 btu's"
"The cost had to be around $10,000; the A/C units are about $5-6K via internet and the contractor won't underprice his labor." A lot of the manufacturers WILL NOT warranty the units if purchased over the internet, be careful and check it out first. Fujitsu specifies that they will not warranty internet purchases. We did the LR and MBR. I now wish we had done the whole house. Next year we will probably have another 2 zone system put in the back of the house. The indoor units are super quiet - and remote conrolled as all other brands are - and the outdoor unit is very quiet also, though it sounds more like a fridge turning on and off. We brought our neighbors over to see and hear it after installation so they would (hopefully) not notice the sound or that it would not bother them. They were fine with it. We are getting ready to have a Fujitsu system (2 zone) installed in my dad's Los Altos Hills home. He is 85 and they never put AC in their custom home when it was built in the '60's- as the builders and designers said AC was not necessary in the Bay Area. He now lives alone so we will be just doing the master bedroom and den. That's where he spends 90% of his time anyway. How do you like the performance and features of the Fujitsu? We have been real pleased with the Fujitsu units. They cool the bedrooms down in 5 minutes. The contractor is still trying to work out a couple of bugs in two of the units.